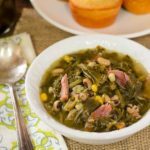 A recipe for turnip green soup made with fresh turnip greens, ham bone, black-eyed peas, onion, and corn. It is a southern-style soup for any time of the year. Heat olive oil in a 7-quart dutch oven or soup pot over medium heat. Add onion and cook, stirring occasionally, until soft and translucent (about 5 minutes). Add ham bone, corn, black-eyed peans, broth and pepper. Stir to combine. Add turnip greens and increase the heat to high. The greens will wilt as it comes to a boil. Stir or toss occasionally to combine ingredients while it is coming to a boil. Once it reaches a boil, stir in pepper sauce and reduce heat to a simmer. Cover and cook for 2 1/2 to 3 hours, stirring occasionally. Serve with additional pepper sauce if desired.